Things like this are often "complicated". I want to see the book, so I am patient and tolerant of any and all complications. I suspect that many other readers of this Forum think likewise. 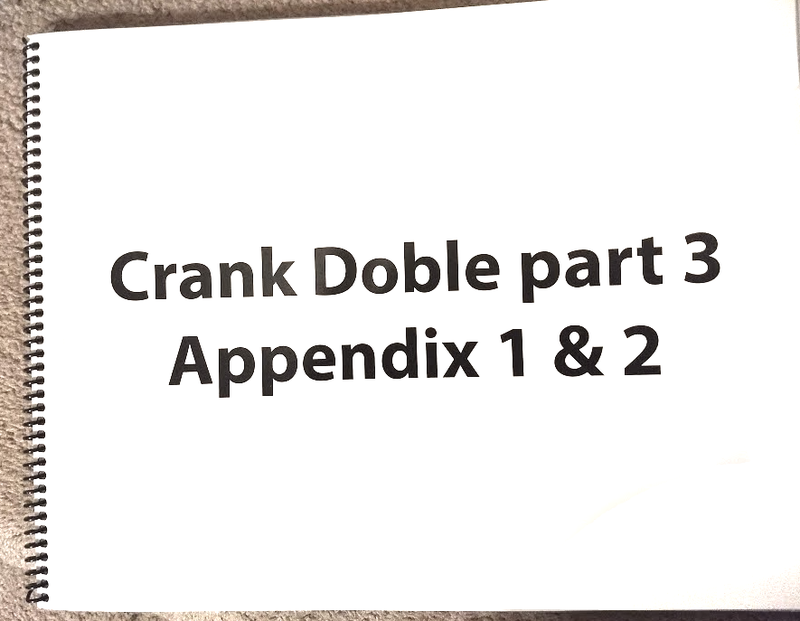 Best wishes to everyone working on Jim Crank's book about the Doble steam car; may their efforts succeed, and may the book be available to everyone interested in the very near future. I suspect that I am very far from alone in saying that very many of us in the light-steam/steam-car community are avidly interested in reading this book, so "keep moving forward" [Walt Disney], "get on with it!" per Colonel Graham Chapman [Monty Python], and we wish you every success in completing it and making it available. Edited 3 time(s). Last edit at 12/17/2018 01:01AM by Peter Brow. Looking at the layout for the Doble ( I know, here he goes again) , it's puzzling why so many designers of that era and even now disregard thermal loss - the boiler out front and the engine out back. A knowledgeable steamboater/steam railroad man I know made the comment, the small steam engine out in the breeze is a better condenser than expander. The benefits of superheating and Cylinder re-heating is understood, and countering thermal loss, seems it would have been better on these engine - on - rear - axle designs to put the engine near the boiler out of the wind and run a driveshaft to a rear differential which suffers virtually no loss. Of course, White basically did that, except the out in the breeze part. 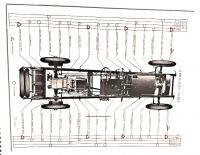 Whitney understood this and his original design which Stanley, Locomobile and several other followed positioned the engine in alongside the boiler and the original design called for the engine cylinders to be encased with the boiler as well. Trevithick, Murdoch, Atwood etc positioned the cylinder inside the boiler. Much heat can be had in the 400°F range for free with the flue gas, which is much better than 70°F range wind over the surfaces. On our little buggies we have the apron in front of the engine, raise it up at high speed and vehicle decelerates. The pressure of steam is only what it is at temperature, temperature loss is steam loss, loss of work - horsepower. Have a look at the attached Whitney patent application and the casing around the cylinders. 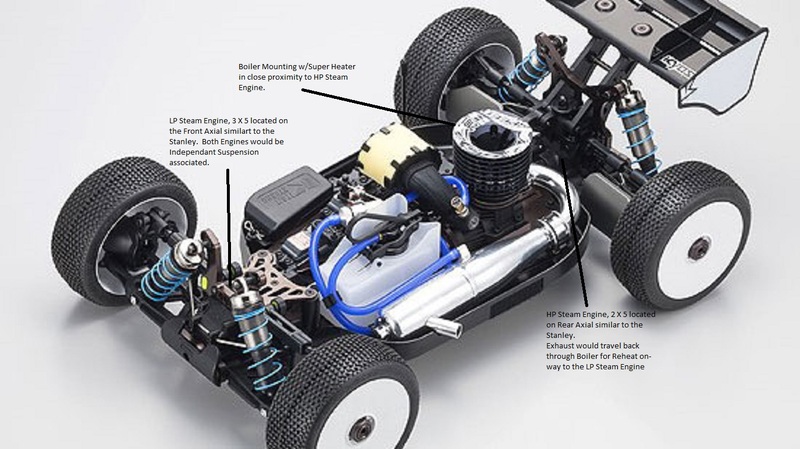 Here is another thought, front wheel drive where the boiler and engine in the front of the car. Put the weight and traction where it can be used best. This was the German Engineering for the Volkswagon. The axel would need to be independant instead of all together like the engine-direct drive methods like most Steam Cars, provide for less unsprung weight. A presentation I gave 2 years ago at the SACA Fall Meet, I suggested a mid boiler sports car where independant, High Pressure engine in the rear and back through the boiler for reheat on the way to the LP engine in the front, independant axel. In essance a 4 wheel drive car utilizing HP and LP engines similar to the later Stanley(s) 2-cylinder, double acting type engine. When I get home, I'll post a concept picture. 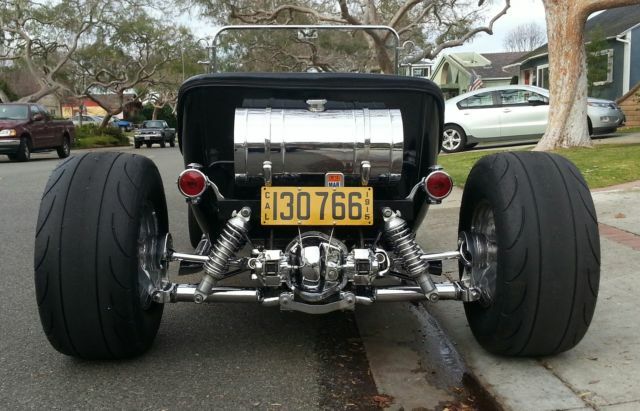 I'd even go as far as suggesting the 10 HP in the rear as the HP and 20 HP in the front as the LP. If all goes well in life, I hope to build this someday. If all goes well in life, I hope to build this someday. That's the real trick, Isnt it. Edited 3 time(s). Last edit at 12/17/2018 02:25PM by Jeremy Holmes. Hope you got a free pass to your shed for 2019! Hope you have heard the story from my good friend Tony G. He has all this steam stuff that works. Basically tells me with a smile, "Engineers don't know sh#$5t". He keeps me humble. I'm thinking you are too! That sounds like an interesting design. I too, think about a modern steam car from time to time, much of the focus would be on limiting the loss of heat and using the heat to it's fullest by means of cylinder reheating with flue gas - to the point that the cylinders and heads would be finned to not dissipate but rather collect heat for higher efficiency, most of the vehicle exterior would be condensing surface. Not sure if I will ever build it, but it's fun to think about. I think the plausibility of a modern steam car would be in utilizing heat from chemical reaction in the abundant supply of toxic waste in safe cells. Er something That is the real key to a modern steamer, cheap heat that can't be used any other way, any bio/fossil fuel (wood, coal etc) can be gasified and used in an I/C engine more efficiently. That was why Howard Hughes scrapped his proposed steam car, not wishing to be surrounded with condensers full of hot water and steam. Was his idea similar to this? Exterior of the body as condenser? 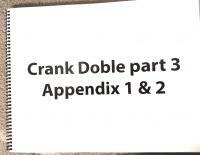 He did own a steam car Doble E-20? if memory serves correctly. A condenser at vacuum is most likely the safest steam thing to be around. You have brought up the 'waterman' system at some point. Edited 4 time(s). Last edit at 12/21/2018 03:59PM by Jeremy Holmes. 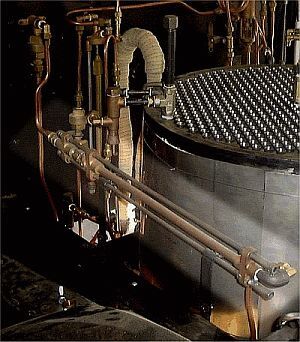 The waterman system (as I understand it after reading Ken's post on the thread linked above) uses a steampump and gets its steam at the desired boiler water level, the pump can run on steam or water at pressure due the two stage valve design. On the tugboat, I have 5 different methods of adding feedwater and that is one of them, I use a Southworth 1-1/2" x 1" double acting steampump, it works flawlessly, unfortunately it works at high cost. The pump runs continually on either steam or water maintaining the water level, running on steam it consumes quite a bit as the pump runs fast, running on boiler water, it slows considerably, but the water being consumed by volume is lost steam at 1400 times that. The most efficient feedpumps are crankshaft driven mechanical, as they are a very small negative to shaft horsepower. And the plant runs most efficiently when the bypass can be tuned to demand, feed matches steam generation. Boiler output is greatly increased. Read "Driving Without Gas", by John Ware Lincoln, before writing any obituaries for solid-biofueled steam cars, or proclaiming the inherent eternal superiority of gasogene/IC vehicles. Lincoln actually built & ran gasogene/IC cars. 50% of the energy in the fuel goes straight out the stack, pure waste. Used copies can probably be had from Amazon or eBay for a few bucks. Well worth reading if you have any serious interest in the technology. The book also has a very interesting chapter about steam cars, of interest even to anyone not interested in solid/biofuels, though I disagree with some of his conclusions about the future potential of steam car technology. Having bestowed the title of "Steam Jedi Master" on our friend Tony, I hesitate to criticize, but I might put a finer point on his comment about engineers. I applaud his critical approach. Some engineers, indeed, "don't know $#!+". Most however, do know, well you know what. Alas a very few have developed the habit of thinking that their engineering degrees, perhaps because of the particular prestigiousness of the granting institution, are somehow proof that any opinion which they happen to develop is incontrovertibly and unalterably correct, and that anyone who disagrees with them about anything is automatically wrong. A few encounters with engineers of that [happily] rare type is enough to convince many folks of the nonsensicality of the engineering profession. A friend of mine once called engineers of that type "diploma wavers". In my many years of correspondence with all sorts of modern light-steam luminaries, I have found that, on some issues at least, for every prestigiously-degreed engineer who pontificates that his particular view on some technical issue is incontrovertibly scientifically "true", there is often an engineer, or several engineers, of equally prestigious, or even superior academic or professional credentials, who confidently dis-agree(s) with him on that point, with copious evidence, professional engineering literature references, and reasoning to back up their differing views. In quite a few cases, my debates on this and other Forums have prompted the dissenting engineers to contact me via Private Messages or private e-mails. Some of the things which they have told me privately have been quite astonishing, and very much at odds with what might be called "the Official SACA Consensus View" -- curiously anti-steam-car btw despite the Club's name -- which they did not dare to publicly question. Among engineers there seems to be a Code of professional courtesy, kind of like the Codes followed by cops & private detectives in "hard-boiled detective" novels, which prevents them from publicly disagreeing with their professional engineer colleagues. I live by a Code too, so I get that. The real story, behind the scenes so to speak, can be a real eye-opener and mind-warp. What is seen publicly on internet Forums and webpages often has little relation to steam-automobile engineering reality. 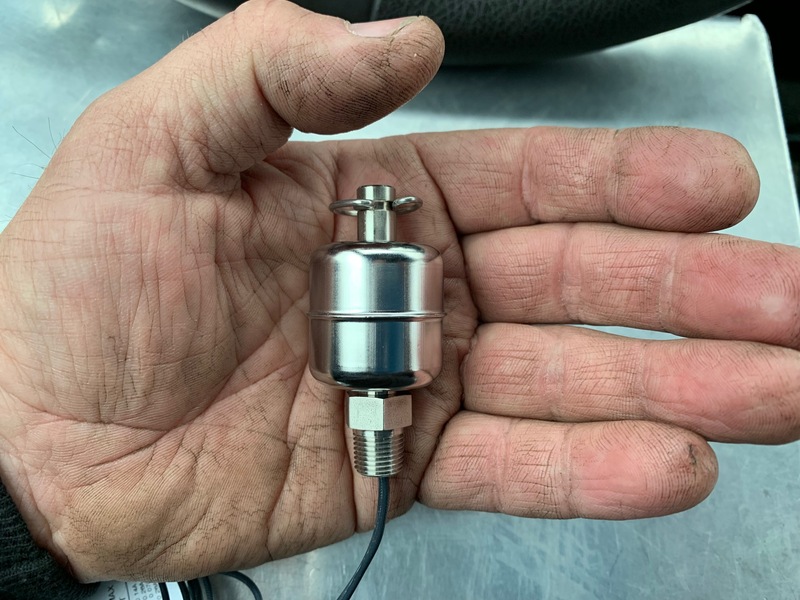 This might help explain some of the apparently bizarre and ridiculous, and often unpopular, light steam power technical opinions which I have expressed on this and other Forums, and in my websites. So, in a way, Tony is right. At least in rejecting the idea that "if a degreed professional engineer says it, then it is always true". I would add that over the years I have read quite a few old articles by professional engineers with prestigious degrees "proving" that airplanes, internal combustion engines, jet planes, space travel, atomic energy, and quite a few other things, can never work. This reminds me of the old story about how an aeronautical engineer once proved, through standard aeronautical engineering analysis, that bumblebees cannot fly. Bumblebees, however, cannot read engineering journals, so they just keep on flying anyway. Don't get "humble", get _scientific_. Develop hypotheses and build/test them. If it works great, then you can skip the humility. On a more positive & pleasant note, I have recently replaced the stack of SACA magazines on my living room coffee table with ancient copies of "Floyd Clymer's Steam Car Scrapbook" and "Oldtime Steam Cars" by John Bentley. The cheery dust jacket of Bentley's book has a delightful picture of James Melton at the wheel of a wonderful coffin-nose Stanley Steamer, with of all people Charley McCarthy and Edgar Bergen sitting next to him. They all seem to be having a great time. And who wouldn't, given the chance to hit the road in a fine steam car. That's what steam cars are to me, good fun out on the open road for all. Edited 1 time(s). Last edit at 12/23/2018 07:30AM by Peter Brow. There is no teacher or lesson to be had like experience. Build your idea and it will answer several questions definitively and reveal things that were never even thought of. Wood/coal gasification vs steam: I know a guy personally that does wood gasification routinely and powers a small pickup truck, he drives it back and forth to work often at 17 miles distance. For this trip one way requires one 5 gallon pail of woodchips. I can state with utmost certainty, that the same amount of wood fuel would do well to raise steam on a boiler capable of that amount of work. My Tug at 10 hp burns about 1000 pounds of wood per day to go about 25 miles.I jokingly reply to the question I often get about "how much fuel does she use?" I reply "About a tree per day" If some destination is 75 miles - that's about three trees. According to one book I read on the subject, at one time there wasn't a tree within 300 feet of the Mississippi anywhere. "There is no teacher or lesson to be had like experience. Build your idea and it will answer several questions definitively and reveal things that were never even thought of." Exactly what I plan to do. Actually, my build has already started. Even the build process is answering questions and revealing things. Edited 2 time(s). Last edit at 12/23/2018 11:17AM by Peter Brow. if two copper wire coils could be inserted in a pipe and the 2 leads gotten through the walls. (the other 2 can be grounded inside) The two coils positioned beside each other with space between. Tune them with capacitors outside. A low power RF frequency applied to one would induce a signal in the other which could be amplified and used to control switching. Conductive water between the coils would interrupt the transfer of inductive coupling. Although not the easiest to set up, and I like to keep things as simple and reliable as possible. But still manage to automate water feed. 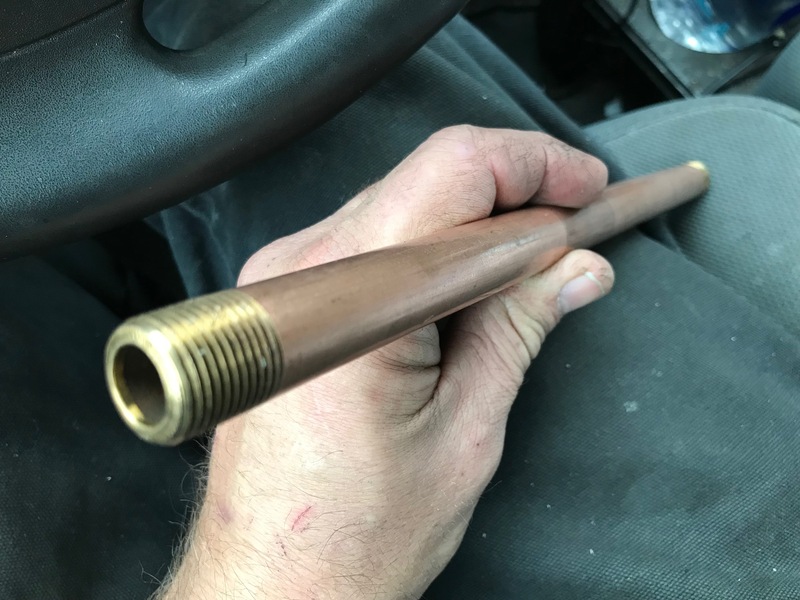 A small magnet inside a wood float, riding inside a copper pipe might work ok. Long as it was a side pipe on the boiler, not the main pipe on a monotube. Replacement for the glass sight gauge with hall effect devices to switch things on and off. A wood fired boiler with some sort of water/steam drum is what I usually think of as practical. Since monotube doesn't lend itself to wood firing all that well I'm always thinking in terms of ofeldt or yarrow types. 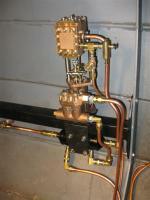 Might could try it with a pin that slides through a sealing plug to get a mechanical movement through the boiler wall. While pressure would try to push the pin out. 1/8" dia would not give it much push. 2.5 lb push at 200 psi. counter that with a spring and use a good size block of water resistant lightweight wood for a float. (problem gettin it to slide easy and still not leak steam) The more I think the more crazy configurations I imagine. Like the float inside sliding a rod in a pipe with magnet on the end of the rod. I need to experiment with some of them eventually. 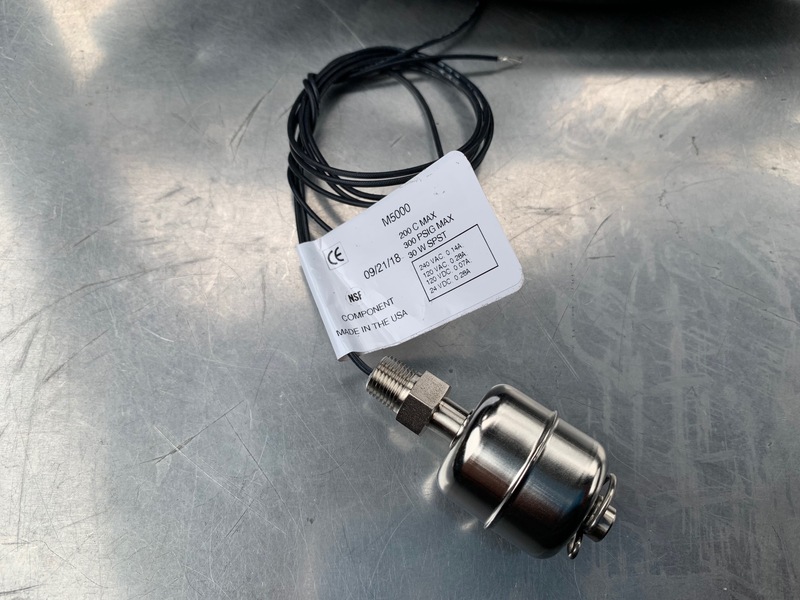 I could put extra fittings on my current boiler to play with something, or build another one with a bolt on end plate that accesses easily to an internal float. In any case the long term job I've chosen to pursue is nutrient dense agriculture with it's necessary carbon input. Which entails making biochar for many years as I develop it. I should make a boiler steam engine arrangement to split firewood that would make charcoal out of the burned wood. A rack and pinion splitter running off a flywheel would work good for that.